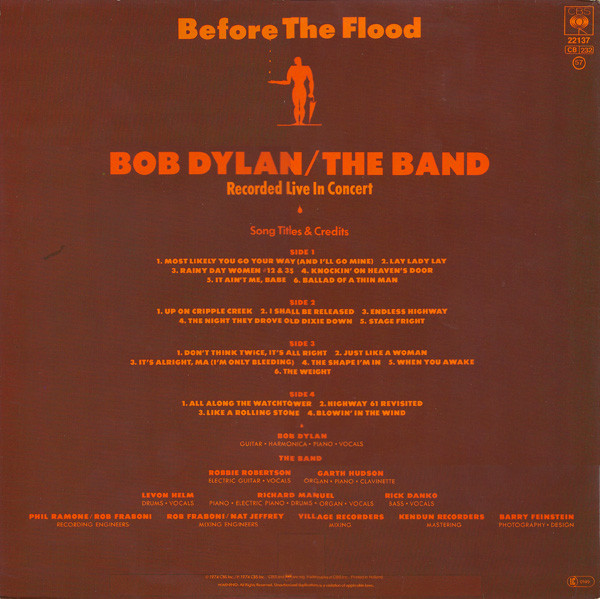 This is possibly Bob Dylan's greatest live album and it is also considered to be one of rock music's greatest live albums of all time. In 1974, however, Dylan had been in something of a rut and The Band had seen their better days pass by. Dylan reunited with his old Band(mates) and conjured up a vibrant set of songs dripping in nostalgia (most of them are from the mid-sixties), even in 1974, but also what were often reinterpretations. The instinctive interaction between Dylan and the Band is clear for all to hear. The remastered sound on the latest edition (in the "Complete Works" box set) is superb. "Most Likely You Go Your Way (And I'll Go Mine)" is an effervescent, rocking opener with Garth Hudson's organ swirling all over the place and Dylan on enthusiastic vocal form. "Lay Lady Lay" has a typical Band backing. "Knockin On Heaven's Door" is just perfect. 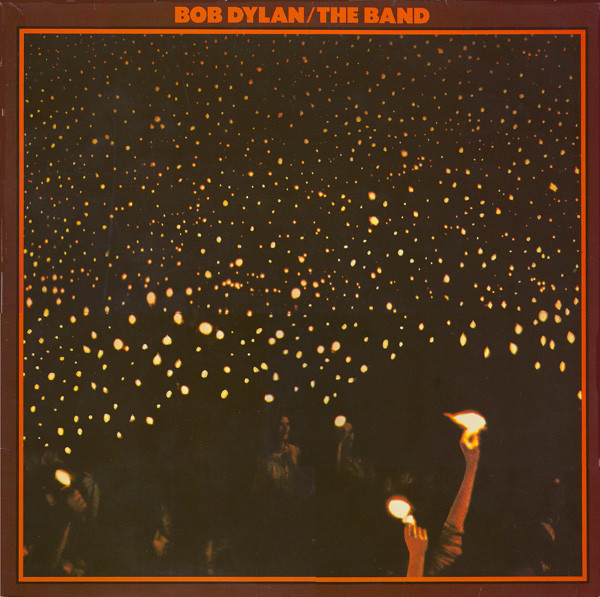 Dylan's vocal is yearning and sad and The Band are just superb. Excellent, crystal clear percussion, drums and keyboards. "It Ain't Me Babe" is given a radical country-ish rock makeover, with some Cajun undertones. This would develop into a reggae style backing in 1975's "Rolling Thunder" tour. The seeds of the future pacier renderings of the song were sown here. "Ballad Of A Thin Man" is just sumptuous, with more addictive backing. The Band are just so damn good on this album. Now it is time for The Band's brand of retrospective rustic rock. "Up On Cripple Creek" has a funky, wah-wah guitar and organ backing and a soulful vocal. "I Shall Be Released" is evocative and plaintively delivered. "Endless Highway" has a great bass line and another Cajun-sounding organ riff. It rocks, solidly. I have always loved the Civil War-based song "The Night They Drove Old Dixie Down" (covered by Joan Baez). Actually I prefer Baez's version, but I don't dislike this one. It is their song after all. "Stage Fright" has a great drum/piano and organ intro and another slightly funky feeling to it. Dylan is back now, for an acoustic "Don't Think Twice, It's Alright". The solo acoustic numbers continue with the wonderful "Just Like A Woman" and "It's Alright Ma, I'm Only Bleeding". He sounds so vocally committed on these tracks. The Band return with the delicious bluesily soulful "The Shape I'm In". 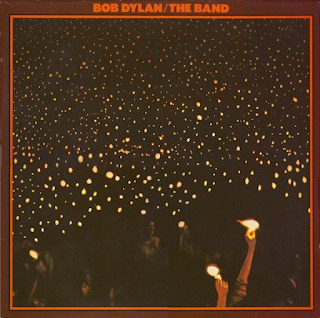 The melodic "When You Awake" and the iconic "The Weight" conclude their solo stuff without Dylan. The great man returns to join them for a barnstorming ending to the album. "All Along The Watchtower" is energetically superb, with some guitar that Dire Straits made a career out of a few years later, and an appealing "Highway 61 Revisited" has a slower, bassier groove than the original. It is again slightly funky. I really like this version. "Like A Rolling Stone" is positively incendiary, maybe the definitive Dylan live version of the track. He is on fire. Garth Hudson's organ is sublime too, even giving us some playful stuff after the "tricks for you" line. The closer, "Blowin' In The Wind" is given a rockier backing than usual - a Band groove rather than an acoustic one. It has a great guitar solo in it too. 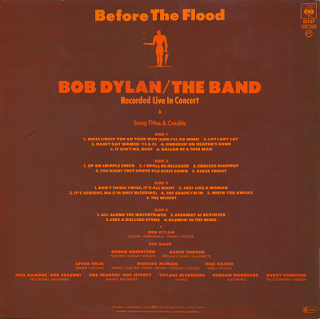 It is an enjoyable experience listening to this album, with the Dylan stuff and Band performances side by side. Full of variety. No need to recommend it, is there? It speaks for itself.